In the Dirt: Rangers Fall in Historic Fashion, Kaberle Anyone? Rangers Fall in Historic Fashion, Kaberle Anyone? After taking a 5-0 lead early in the second period against the Canadiens, the Rangers collapsed and lost 6-5 in a shootout Tuesday night in Montreal. Jaromir Jagr stretched his goalless streak to 12 games, but made up for that with four assists as his line clicked early and often. Brandon Dubinsky, who scored the first goal of the game, had a Gordie Howe hat trick as he assisted on a Sean Avery goal and fought Long Island's own Mike Komisarek. Jagr's line was so good they helped chase Canadien goalie Carey Price after he gave up three goals on 11 shots in just 13:56. Chris Drury and Brendan Shanahan each picked up their 20th goals of the season in the second period. The Rangers were playing a fast paced and physical game and did a decent job staying out of the box and away from the best power play in the NHL. Then with a 5-0 lead the Rangers went home early. At least that's what it felt like to most Ranger fans as the Canadiens came on strong scoring five unanswered goals to tie the game late in the third period. It would be the first time in franchise history the Rangers blew a five goal lead and the first time the Canadiens ever came back from one. The ensuing let down occurred when Henrik Lundqvist failed to make saves that could have been made, particularly the first goal by Alexei Kovalev. Lundqvist looked like he stopped the shot, but failed to hang on to the puck as it trickled in the net behind him. Dan Girardi and Fedor Tyutin, two players who like Lundqvist just had their contracts extended, also failed to cover open players and clear rebounds. They were each negative-two during the game as Montreal had plenty of space to maneuver while these two were on the ice. 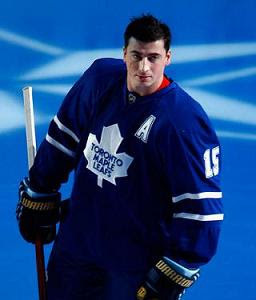 After the game one couldn't help but think about Tomas Kaberle who has been rumored in deals with the Rangers. Kaberle is more of an offensive defenseman, but there was a big difference in the way the Canadien defensemen kept the puck in the offensive zone keeping the Rangers off offense and the sift that was the Rangers blue-line. A strong blue-liner could have made a big difference in this game. Down 5-0 Michael Ryder, who has slumped most of the season and been involved in numerous trade rumors, netted a pair to get his team and the fans back into the game. Starting the third down 5-2 the Canadiens continued to march toward a comeback. Former Ranger Alexei Kovalev scored on a one-timer off a cross ice pass from defenseman Andrei Markov to make it 5-3. Then just nine seconds later defenseman Mark Streit scored by deflecting a shot from Michael Ryder to make the game 5-4. The Canadiens capped off the unlikely comeback on the when Kovalev scored and tied it at five. Andrei Kostitsyn made a strong pass from the corner and Kovalev fired a hard one-timer from the slot as he fell due to the follow through. The game went to a shootout after neither team could score during overtime. Saku Koivu scored for Montreal in the second round which was all goalie Cristobal Huet needed as he stopped Shanahan, Drury, and Jagr for the win.